i just realized i never posted the poison ivy pencil commission i did that i'm planning on coloring this week. 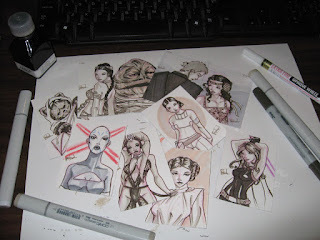 it's for the same guy i drew the harley quinn for. i have the Tattoo Life and Gothic Beauty magazines to thank for inspiring the piece. i'm neither tatted up nor goth but i do like their styles. the tattoo magazine really gave me a lot of inspiration on the leafy/viney patterns on her and the gothic one just gave me the mood of it with the branches growing out and stuff. if i had money to burn i'd probably subscribe to both magazines just to be inspired - but i don't. so there's that. ended up working on my dad's church flyers and stuff tonight so that's one night down that i'm not coloring this piece. we'll see what happens tomorrow. 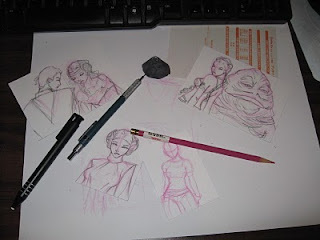 i've started to ink these star wars sketchcards. been lookin for an excuse to use my walnut ink so voila! 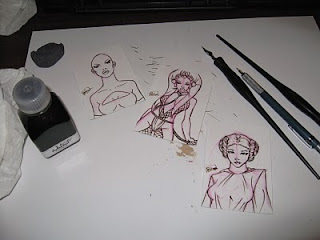 i use a quill pen to ink and i've been doing so for a couple of years now (i think). but i still feel awkward using it. albeit i don't ink often but i was hopin i'd get used to it by now. and just to demonstrate how annoyed i am at my lack of comfort with a quill and ink, i screwed up Oola's eyeball! blower. i'm trying not to panic and think of ways i can remedy the situation but its hard to not be pissed when it was actually my favorite one out of the set! just a fateful ink glob escapes and it's a wrap on my day. i'm sure it's probably not even that bad but fellow artists know that when u screw up something in ur artwork, that's all u see. *sigh* i plan on graying these once i'm done so maybe it'll be even less noticeable. i'll still see it though. poopies.